As much as I love the English language and champion its practicality among all the tongues of the world, I've always admired Spanish for placing the noun before the adjective. Just think about it. The noun is generally more important, therefore, should come first. In this case: chicken grilled. Those of you from the west coast will know El Pollo Loco, or as I like to call it, "The Chicken Crazy," which by the way, never offered a chicken burrito quite as tasty as this one, in my humble opinion. Sonia might disagree, and while nobody's personal assessment is more or less valid than another's, hers goes quite a long way in terms of deeming what is "authentically Mexican" and what is not. Like offerings from Qdoba and Chipotle, this burrito is highly Americanized, but still brings some distinctive Mexican, or at least "Tex-Mex," flavors. For that reason, I liked it. It had plenty of peppers, black beans, corn, and rice, and I noticed a decent amount of shredded, grilled chicken, too. Sonia didn't think there was enough of that pollo—or at least that it wasn't flavorful enough to be noticed. The burrito was surprisingly sweet. 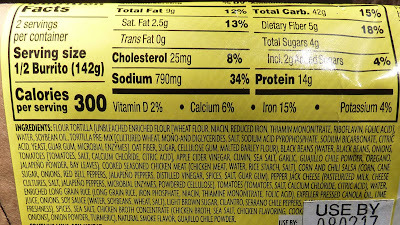 I'm not sure where that was coming from, although "sugar" is listed on the ingredients in at least three places. See what I mean? Americanized. Muricans gotta throw sugar into everything. My biggest complaint, though, was a decided lack of heat. This burrito wasn't spicy at all—which was disappointing because "salsa" is mentioned right on the wrapper. I know not all salsas are five alarm fires, but I generally hope for at least a little extra kick. Not here, unfortunately. At just about four dollars, this isn't the cheapest grocery store burrito you'll find at Trader Joe's—or any other marketplace, for that matter. However, when compared with those above-mentioned "Mexican grill" type restaurants, you'd be hard-pressed to find anything this cheap. And quality-wise, I'd say this offering should be compared to those restaurant burritos, not the average frozen thing at the grocery store—primarily because this burrito does not come frozen, but rather, refrigerated. For that reason, I think it tastes a great deal fresher than frozen burritos with similar ingredients. I was lazy and crass enough to heat this item in the microwave rather than the oven. But neither Sonia nor I think that would have made much difference here. Any way you slice it, I was gonna wind up liking this burrito con pollo asado, and Sonia was gonna wind up going "meh." Four stars from me. Two and a half from her. This sounds like a good candidate for some Green Dragon sauce. Or TJ's habanero sauce for extra heat. I also like to heat pre-made burritos on a dry skillet over low-med heat, flipping occasionally. Gives the tortilla more flavor. Yes Green Dragon would have been perfect! Nope; didn't care for these, at all. It was the sugar, and I was cursing myself for not having read the blasted label before buying it. Why, oh why, must that infernal ingredient be snuck into everything!? I still remember when, years ago, my favorite hot dogs were corrupted by sweetness. ( the tip-off was the "new! better tasting!" label on them). I won't buy Stagg chili for the same reason. Sugar has no business being presentbin a savory product. 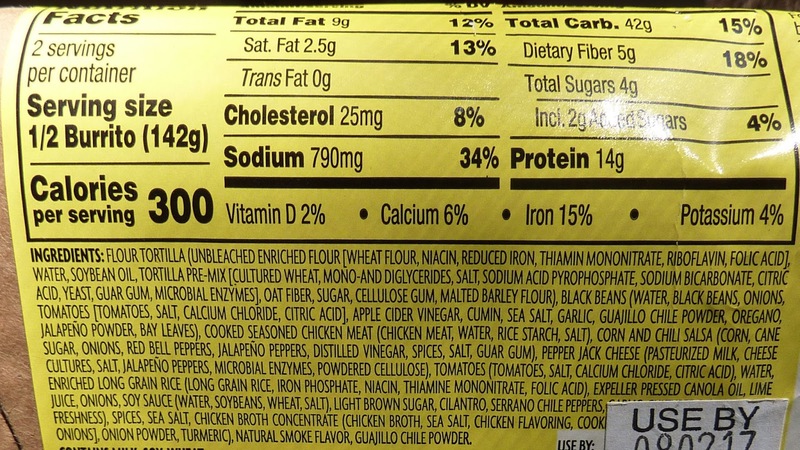 If you see it on the ingredients list, it's because something more egregious is being hidden by it!! I really enjoyed the pork version. Didn't care for the chicken. What is with the half burrito as serving size?? Either they should make a smaller actually single serving size or package this as two separate halves. I haven't tried this one but there's a "super burrito " with quinoa and sweet potato that is great and actually quite spicy. And one burrito equals one serving. 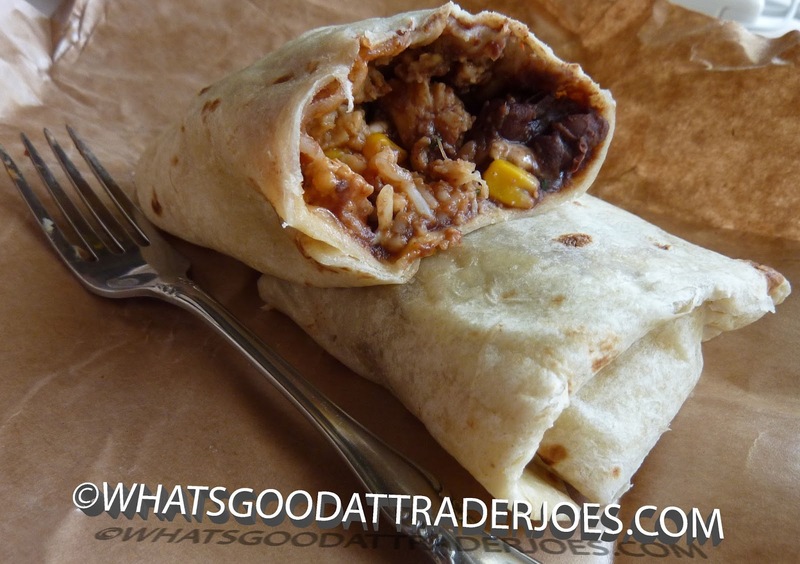 But generally i would rather make my own burrito...with TJs soyrizo of course. the tomato-less corn chile salsa from TJ's (which is apparently in these) is sweet as candy. I can't stand that salsa for that reason, despite its popularity, because it tastes like straight up corn syrup to me. That could explain the sweetness.